1. The idea for The Pledge was born from Laura’s and Christine’s college experiences. Laura belonged to a sorority at the University of Maryland at College Park and Christine was part of a drug-free exhibitional gymnastics group at Maryland. 2. Secondary characters are so much fun to write. Caz, Alec’s crazy roommate, is based on a friend Christine had in college. 3. William is loosely based off a friend of Laura’s brother, Dan. Dan’s friend often changes his name and Laura fell in love with his zest for life and with his ability to alter his perspective. 4. Almost all of the locations in The Pledge actually exist at UMD or nearby. The kissing tunnel, the climbing wall, the Graham Cracker, Sandy Spring Adventure Park, and the trampoline room are all real places. The only location that doesn’t exist is the bar, Shell Shocked, but that bar was modeled after one Laura frequented (frequently!) called Terrapin Station. 5. A fun fact…Taren’s dorm, Denton Hall, was where Laura lived during her freshman year. Alec’s dorm, Centerville, was where Christine lived. Both dorms are on opposite sides of the underclass residential area of campus. The location of the dorms are symbolic of just how opposite Alec’s and Taren’s lives are. 6. The names of the fraternities, sororities, and the Acroletes are all made up to protect the reputations of the various groups that inspired the story. However, many of the events are based on reality. Laura has had beer dumped on her at her initiation party and Christine has flipped through fire. 7. Laura’s sorority had a chef named Lisa, who did in fact, punish the girls when they were messy by denying them access to fat free cheese! 8. Laura is a morning person and likes to write before her kids get up. Christine is a night owl and likes to write after her kids go to bed. 9. The red string of fate is a real East Asian concept where two people believe they are connected by an invisible thread that may get twisted, but will never break. 10. Like Alec and Caz, Laura and Christine played on the ropes course at Sandy Spring Adventure Park. Unlike Alec, Caz, and Christine, Laura was not a natural! always craved, but not the love she needs. addiction to danger helps him gain his independence, but it comes at a heavy price. When the two cross paths, Alec fears his undeniable attraction to the party girl just might threaten everything he’s worked so hard to earn. Taren hasn’t forgotten that Alec humiliated her back in high school, but she also can’t deny the chemistry they share. and yet it’s too hard to ignore. When their worlds clash and they both end up suffering, will they fight to stay together? Or are some pledges too hard to keep? The first thing Christine does when she’s getting ready to read a book is to crack the spine in at least five places. She wholeheartedly believes there is no place as comfy as the pages of a well-worn book. She’s addicted to buying books, reading books, and writing books. Books, books, books. She also has a weakness for adventure, inappropriate humor, and coke (the caffeine-laden bubbly kind). Christine is from Forest Hill, Maryland where she lives with her husband, three kids, and her library of ugly spine books. husband, three kids, and her library of ugly spine books. Blog Tour Stop! 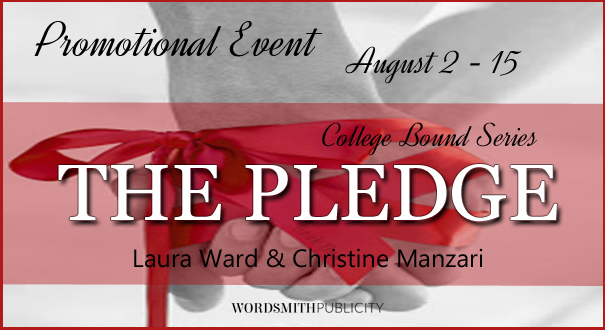 The Pledge by Laura Ward & Christine Manzari!